Edinburgh, the Capital City of Scotland, makes a perfect day trip for visitors staying in Glasgow hotels. Less than one hour's drive by car, there are frequent public transport links from Buchanan Bus Station and Queen Street Train Station in Glasgow. 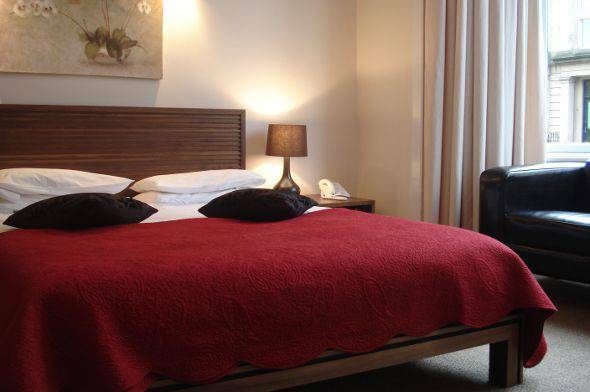 The Sandyford Hotel offers cheap bed and breakfast accommodation within easy travelling distance of Edinburgh, and can provide you with information about things to do during your visit. Edinburgh's most distinctive visitor attraction is Edinburgh Castle, which dominates the skyline from Princes Street. Sited on Castle Rock at the top of the Royal Mile, Edinburgh Castle is the venue for the annual Edinburgh Military Tatoo in August. During August and early September each year, Edinburgh is home to the Edinburgh Festival, the world's largest collection of arts, music and comedy festivals. The Edinburgh International Festival, the Edinburgh Fringe, International Film and Book Festivals all run throughout the summer under the umbrella of the "Edinburgh Festival".